The working relationship between sales and marketing is sometimes like a knock-down-drag-out bout, with both sides sticking closely to their corners, challenged to find a productive common ground. Fortunately today, with the help of advancements in motivational tools, the goal of aligning these two rivals into one unified and productive sales force is well within reach. So how do you do it? Where do you start? 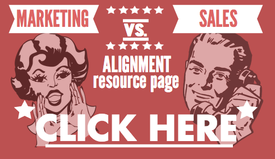 And why should you invest in improving sales and marketing alignment? Our new infographic, “Battle Royale,” looks at the rivalry between sales and marketing and the points where alignment breaks down, as well as the benefits that come with success. Check it out below, and if you want to take it, use it or pass it around, feel free! Also be sure to check out our Battle Royale: Sales vs. Marketing Resource Page, containing a growing collection of eBooks, blog posts and infographics, which cover the topic of sales and marketing alignment, motivation and execution. Sales & Marketing, age old rivals: our new infographic looks at where sales & marketing alignment fails, as well as the benefits that come with success.